BEDFORD-STUYVESANT — A curator who runs an African art museum out of a first-floor Bed-Stuy apartment wants to find a new venue to house roughly 4,000 pieces of artwork from 44 countries. 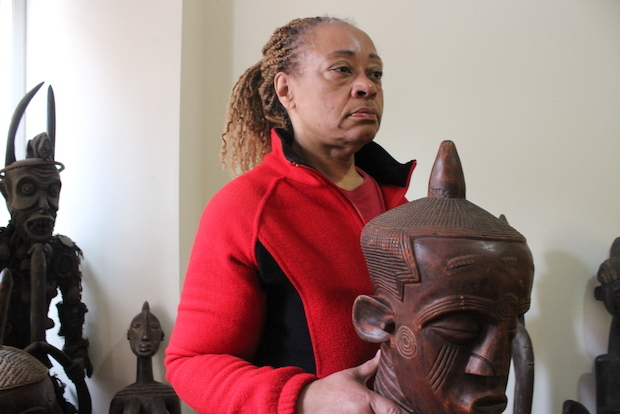 Symbols of Tribal Sirits: the Bedford-Stuyvesant Museum of African Art is a nonprofit program run by Vira Lynn Jones, an avid collector of African art and former help desk analyst who started the museum in 2004. The collection has drawn comparisons to the Museum of Contemporary African Diasporan Arts in Fort Greene, Jones said, despite the museums being decidedly different. MoCADA features contemporary art from the entire African disapora, while Jones' museum focuses solely on traditional art from the African continent. Armed with artifacts between 50 and 150 years old, Jones' mission is to help visitors understand different cultures. "We don't want people to just come and see the exhibits," Jones said. "We want to educate people about the pieces. What the meaning is." Jones' love of African art began while a member of the Peace Corps in Ghana. She traveled all over Africa, in the Ivory Coast, Mali, Burkina Faso and Togo before moving back home. Inspired by her aunt, a member of the United States Foreign Service for 30 years, Jones began to amass her collection. After being laid off from her help desk position in 2002, Jones started to sell off some of her collection to get by. It was then that she started to notice peoples' interest in African art and realized the possibilites of teaching people about African culture. For the past 10 years, Jones has housed her artifacts in a Bedford Avenue apartment, showing them off whenever she has an opportunity. Her collection includes ceremonial masks, instruments, stools and statues from various countries and periods throughout African history. One of her oldest pieces, a mother and child statue from Cameroon, is about 150 years old, Jones said. "Our goal is to show the world the positive contributions of African culture," Jones said. By expanding the museum into its own building, Jones said she also hopes to attract tourism to Bed-Stuy and spur growth for the community. That development would start later this year with construction of a facility, which she is in the midst of obtaining funding for. It would also mean more money for surrounding businesses, Jones said. The curator envisions building affordable housing as part of the deal, she said. "Arts organizations stimulate economic development in the community," Jones said. "We need the money to stay in the community, develop institiutions, develop housing and create jobs." Jones' plans have already begun to gain support. Last year, then-Borough President Marty Markowitz joined the museum to declare October "Celebrate Africa Month," a tradition Jones plans to continue this year. Last week, Brooklyn's Community Board 3 voted to support her plan to build a new museum. With any luck, Jones said, her dream will be realized and she can inspire people to start thinking more globally. "The world is larger than your community," Jones said. "You've got to expose yourself, build a level of curiosity, and go out and explore."